Hello Tiptons Friends and Fans all around the world – we have excellent news! We recorded our 12th CD in beautiful ITALY and are working hard to bring it to you this Fall! 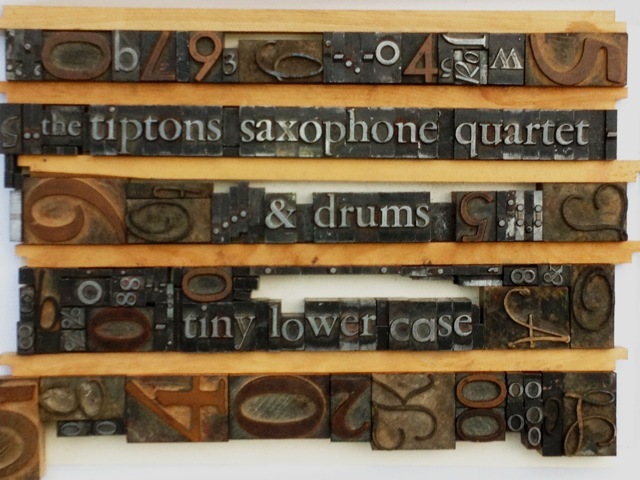 Please contribute to our campaign to fund ‘tiny lower case’ and share this with your friends! Thank you! While touring in Europe this past March, we passed three jam-packed days at Digitube Studios in Mantova, recording ten brand new original tunes, inviting Italian singer Peppe Voltarelli to join us on ‘Amara Terra Mia’, and a Led Zepplin/Carpenters mash-up that must heard to be believed!! If you heard our music before, you may know the Tiptons Sax Quartet was started in Seattle in 1988, first as the Billy Tipton Memorial Saxophone Quartet. Over the years and with continued love and support from fans all over, we shortened our name and expanded our repertoire. You may also be aware that we’ve been touring with beloved Austrian drummer Robert Kainar for the last three years. But many folks don’t know we also love SINGING! Vocals have been a part of our sound before, but this album brings more vocal love and expertise than any prior Tiptons recording. You are going to love “tiny lower case”! These new songs are a mix of ska, punk, funk, jazz, spoken word, rock mash-ups, anthems, songs of joy, noise bop and traditional Italian music. Not only are the tunes rich in imagery and sound but honestly, the horn section of Amy, Sue, Jessica and Tina has never sounded tighter or more luscious. Playing with drummer Robert Kainar, their deep musical connection, freedom of expression and love of making music together will captivate and excite you. Kainar adds his own unique blend of playful precision and 3-ring-circus spirit. Chances are if you live in the U.S. you have not seen us perform with Robert as we only tour with him in Europe, though we have plans to bring him across the pond soon! In addition we were graced in the studio with rich, beautiful, humorous, and melodramatic vocals of good friend and singer/composer Peppe Voltarelli! He joined us from Florence, Italy to add an unanticipated and addictive spice to a few songs! We want to share this music with you and everyone in the world! There is nothing that gives us more joy than sharing our music and render the tapping of your helpless toes!! We are very excited about this recording and we have completed the initial recording and but we still need to pay for it! Then of course we need to pay for mixing… ( Jessica flew from New York to Seattle so she and Amy could complete that in April) then Mastering, CD artwork (original design by Jessica Lurie!) and production and promotion. Touring is another huge expense for us, including plane tickets, van rental, hotels, food, gas and Tina and Jessica need their van snacks! We want to be able to get this album produced and sent to you, and we need your help to do it. We are headed off to Northern California in August to kick off the release of “tiny lower case”! You do not have to wait till we are on tour in your area before you can get a copy! If you help us today, we can send you a signed copy when it arrives in August! In fact we have lots of perks to match contributing levels. Every little bit helps and we try to offer something for everyone. We are musicians and artists. We live to create and share music with you and your friends and families. With your support, we are able to do this and not come home empty handed. For those of you who can’t give money you can still help us out by spreading the word! Send this onto your music loving friends and family. If you love what the Tiptons do and how we do it, let the world know by use the Indiegogo share tools! Thank you so much for helping and sustaining The Tiptons. Together we can change the world through music!